During FY2018 A-Cap commenced implementation of its diversified minerals strategy with a primary focus on the exploration and/or acquisition of cobalt projects to supply cathode materials to the battery industry. A-Cap will continue to advance the optimisation work of its Letlhakane Uranium Project in Botswana, to ultimately supply uranium U308 product to a nuclear facility as prime fuel for base load power generation and its service to the battery industry markets and consumers. While the industry is confident in the long-term fundamentals of uranium and nuclear power, there is less certainty in the short term with industry expectation that the market will gradually move towards balance post calendar year 2020. This market sentiment is evidenced by major producer curtailments, suspension of US government sales to uranium U308 inventory, Japanese facility restart delays and a deferral of facility construction commencements and announcements globally. 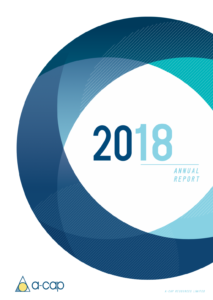 The board’s diversified minerals strategy is focussed at the significant growth expectation and demand shortfall in cathode materials supply to the battery industry. A-Cap is committed to becoming a supplier of cathode materials and to this end will establish partner and strategic relationships with battery grade materials refineries and materials manufacturers to ensure its project development investment is de-risked with stable and cost competitive supply arrangements. A-Cap will structure its partner relationships to take advantage of new materials processing and refinery technologies, particularly in production of cobalt products used directly in battery manufacture, ensuring A-Cap is not exposed in the value chain to the ultimate battery customer. The cobalt industry is responding to an anticipated demand increase driven predominantly by the EV battery industry. McKinsey Minespan estimates1 that the industry could add capacity expansions of between 110 and 120kt by 2025, bringing the total potential mine supply to 225 to 235kt. Approximately 40 to 45kt of cobalt mine capacity additions are expected to come from two projects, both in the Congo – Glencore’s Katanga Mining Joint Venture and Metalkol Roan Tailings Reclamation. The DRC represents 70% of global mine supply of cobalt. Given the increasing supply exposure in the DRC, the proposed development of new cobalt projects in Australia are a direct response to the anticipated shortfall in mine capacity supply. 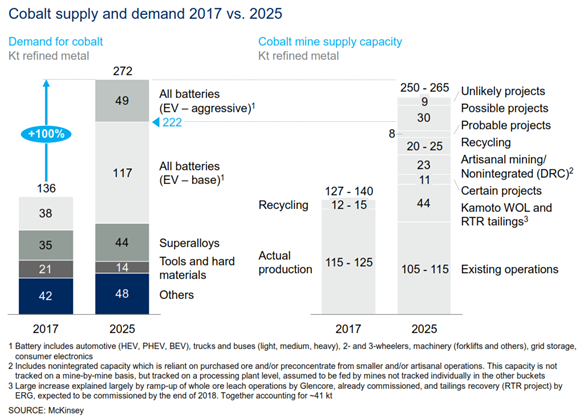 The cobalt commodity spot price can be expected to be volatile as it will be linked to the speed and rate of adoption of all batteries EV and battery chemistries. Cobalt has in the past been dominantly a by-product of nickel and copper mining. China still dominates the world in battery making capacity, currently making up over fifty percent of global lithium-ion battery production. A-Cap’s strategic relationships will be pivotal to the Company’s implementation of its diversified minerals strategy. A-Cap is in a fortunate position to have two substantial Chinese shareholders, Ansheng Investment Co Ltd and Jiangsu ShengAn Resources Group Co Ltd who are working together diligently with the support of the A-Cap board to identify Chinese key strategic and partner relationships to establish longer-term market for its cathode materials supply. Moreover, the A-Cap board continues to engage with potential strategic investors resident in China who are working with A-Cap to support its capital management plan for new cobalt projects acquisition and initial resource exploration work. A-Cap has commenced an Australia-wide search for cobalt opportunities, and in late July 2018, A-Cap signed a binding Term Sheet to negotiate in good faith to enter a Joint Venture Agreement with Australian listed Castillo Copper Limited to explore for cobalt near Marlborough in Central Queensland. The joint venture is the beginning of your Company’s approach to identify and secure cobalt projects. On 28 September 2018, A-Cap entered into a binding Term Sheet with Blackham Resources Limited to acquire a 75 percent Farm-In Joint Venture Interest in the nickel, cobalt and associated metals of the Wiluna Cobalt Nickel Project (Wilconi Project) in Western Australia.Having cleared the conditions precedent set out in the binding Term Sheet, A-Cap and Blackham Resources formally agreed to the terms set out in the definitive Farm-In Joint Venture agreement.